Colorado Jugger Rules have been finished! I have been spending the last month working on it, and wanted to present to you a pdf copy of the Jugger Rules (Colorado Edition)! I was inspired to create this ruleset from my passion for foam weapon fighting. I have been playing the LARP Amtgard for 18 years. Amtgard has its own form of Jugger called Jugging, and I have been playing that version all this time. 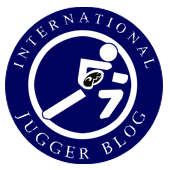 I have looked at German and Australian Jugger over the years, and have always wanted to try it. Jugging/Jugger has been my favorite game to play in Amtgard over the years, and after forming my own foam weapon site, www.foamforge.net, I realized that I had everything I would need to create the pompfen, jugg, and goals. In Colorado, Jugging has been a part of our Amtgard events for as long as I can remember, and I have always heard that people would like to play it more, however Amtgard is a LARP, and their focus is recreating and roleplaying mixed with combat. Jugging has taken a back seat with most groups around the nation, even though it is played, it is rare to see groups playing more than once or twice a year. The main reason is, Amtgard has many other things inside of it, and Jugging is more of a casual activity. I wanted to change that, I wanted to drop the Elf Ears and Capes, throw on a jersey and just play! I have friends that want to do the same, and so here we are! Thank you all for joining me on this journey, I hope to be able to play all over the world one day! ... a loaf of bread had been the Skull at the first Jugger event at a LARP festival in Germany? ... the plastic chain is a Hamburgian invention, while it had been played with ropes at first?